Regardless of who you are, you can always learn from others. 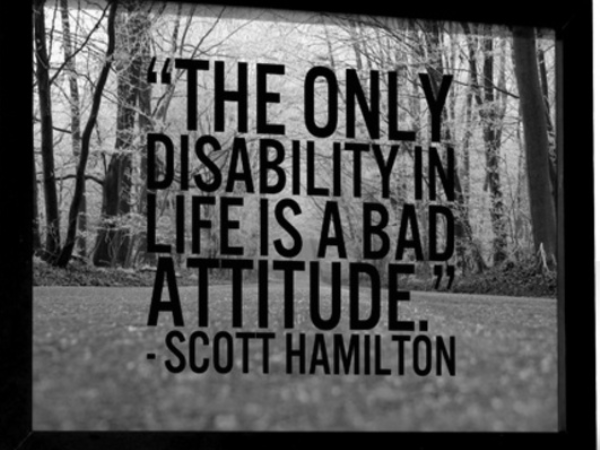 We’re often inspired by the life story of a disabled person. Take swimmer Natalie du Toit, for example, who’s shown you can be a success despite setbacks. Many people say they’d rather be dead than live with a disability, but your brain can adapt amazingly well to your “new” body. Jane Delahunty, who’s been paralysed since an operation in March 2001, says she had to learn to adapt to her disability. “I had to learn to be independent, how to drive an adapted vehicle, bath myself – you name it. We learn from an early age to cultivate patience, but if you have a disability it’s expected of you on a whole different level. Don’t worry about trivialities. Learn what really matters. Is the movie you wanted to see sold out? Nevermind, tomorrow is another day. Things could be worse. While you mustn’t worry about trivial things that go wrong, you must celebrate the small successes in your life. Have you done well in a test? Celebrate it. At least before you start stressing about the next one. Most people spend a lot of time trying to fit in with their peer group. But being unique can be a wonderful opportunity. Lucas Sithole, the 27-year-old tennis player who won the Apia Sydney International Wheelchair Open tennis championship last month, says the accident that claimed his right arm and both legs motivates him. Don’t let life pass you by without doing what you’ve always wanted to do, no matter what. Pieter du Preez was 23 when he was paralysed in a cycling accident. He’s a C6 quadriplegic, which means he can move only his head, shoulders and arms. But Pieter (now 34), who from childhood wanted to be a professional triathlon athlete, didn’t let his disability get him down. He became the first quadriplegic in the world to complete the gruelling Ironman triathlon, consisting of a swim, bicycle ride and marathon.